The journey begins in ‘Jozi’, where we observe, observe, observe: listening with our minds and hearts wide open; seeing with fresh eyes; and connecting with our hearts. Opportunities to engage with ‘cultural activists’ who are using music, art, poetry and film to honour South Africa’s history and culture, and contribute to healing in our country. 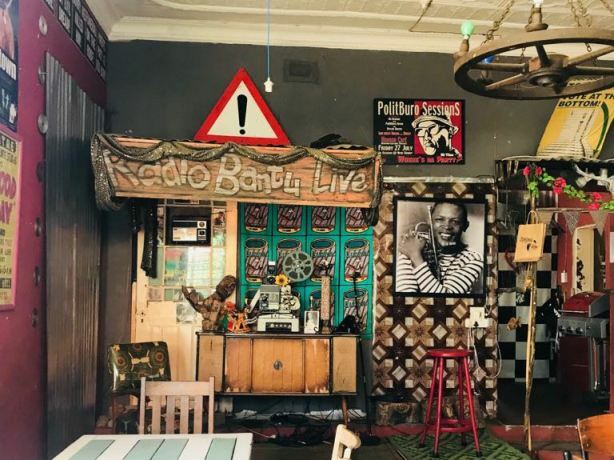 This may include live music at the Roving Bantu Kitchen in Brixton, ‘open mic’ poetry at the Joburg Theatre in Braamfontein, a movie screening at the Bioscope in Maboneng (downtown Johannesburg) or a visit to the Spaza Art Gallery in Troyeville. We are accompanied at times by young service leaders from local youth development organisations. This provides a fresh perspective to the experience and an opportunity to showcase and nurture young talent. The facilitated reflections and activities focus on tuning in and being present to what we are experiencing – seeing, hearing, doing and feeling – during our time in Johannesburg. The journey continues in KwaZulu-Natal, where we retreat and reflect: allowing the inner knowing to emerge. Where better to reflect than out in the bush on an African safari?! From Johannesburg we take a scenic overland trip to a 4-star safari lodge in KwaZulu-Natal (the Leopard Mountain Safari Lodge or equivalent). From here we visit the Hluhluwe-Imfolozi Park – the oldest game park in Africa and the only state-run park under formal conservation in KwaZulu-Natal with the Big 5 (lions, leopards, rhinos, elephants and buffalo). Due to conservation efforts, the park now has the largest population of white rhino in the world. At both the lodge and the Hluluwe-Imfolozi Park, activities include game drives, guided walking safaris, scenic hikes and sundowners overlooking the watering holes where animals gather in the evenings. Other activities may include up-close encounters with elephants and cheetahs, a boat trip on Lake St. Lucia and a visit to the Duma-Zulu Cultural Village. The facilitated reflections and activities during this time focus on looking inwards and making meaning of what we are experiencing (what is significant about these experiences for each of us and why). The journey continues in ‘the Mother City’, where we create, learn, adapt: integrating the head, heart and hands, and exploring the future by doing. Opportunities to engage with individuals and local community-based organisations who are promoting wildlife conservation, social entrepreneurship and sustainable community development. Facilitated reflections and activities during this time actively explore the question ‘now what?’ – where to from here with all this emerging wisdom?! The journey concludes in Cape Town, where travellers catch return flights from the Cape Town International Airport (or stay on to independently explore other parts of South Africa or the region).